After a reconsolidating pause we relaunched Shadow Election today just in time for the Ethiopian Presidential Elections. And the engagement rate has been astonishing: around 3,000 Likes on the Facebook Page only 9 hours after we started a very lightweight ad promotion. This has put us securely beyond the 100,000 global Facebook Fans milestone. We have been getting CTR (click through rates) on the Facebook ads of up to 14.5%, which to anyone who knows about these things is almost unheard of. Our average rates have been 1-3% which is also petty awesome. And this only works if people are really motivate by the subject matter. In addition we have been seeing great "organic" growth too. Shadow Election has always been a big experiment as we try to find ways to help level the political playing fields in national elections and increase democratic participation. Although many people liked the ability to rate online political videos (and articles), we saw from the analytics it was not the key user motivation. 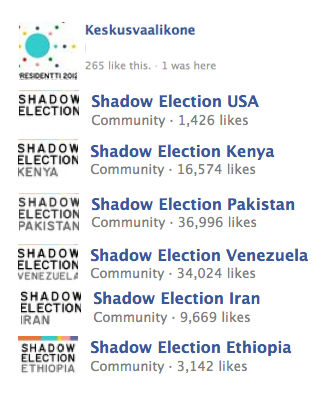 On a number of occasions, we have had much faster Like rates on the Shadow Election Facebook Pages than we had new users to the actual service – which at first didn't seem to make sense: why would people Like us if they didn't even use the service? It then started to dawn on us that people seem to really appreciate the party neutral space that Shadow Election provides. In Shadow Election people are free to "shout out" for their favourite candidates, and make comments on the elections and democracy in general. But they also like to cast a virtual vote to show their support for a candidate. This growing willingness of people to openly show their voting intentions in social media is something we witnessed developing rapidly in our first tests of Shadow Election (then know as Keskusvaalikone – central election machine) in the Finnish Parliamentary and Presidential elections in 2011 and 2012 respectively. Although our Finnish "Facebook" fan base is not so high, for various reasons (mostly being able to – at that time – post voting results directly to the candidates' own Facebook Pages, together with a surprise last minute battle that drew in a lot of social media activity generally) the statistics show we had a potential "impression" exposure to nearly 30% for all Finnish Facebook users. Shadow Election has been a volunteer effort with some partner cash investments and a small Finnish government grant to cover running costs; so it was proving to be too expensive to pay for the servers and to maintain our own service without additional funding. Fortunately, however, Juha Mattila and I found out through our day jobs in the social media agency Zipipop Freud, that we could use a the Offerpop service to replicate the popular "live" voting poll. And it seems to be working very nicely indeed – although if there is one more thing we have learnt is that the reaction in every country is different. Also the nature of the relationship between the Shadow Election and the real elections results has varied considerably; but, having said that, there has always been significant correlations between the two. Users rate what they think the candidates stand for. What people think candidates represent is in many ways more relevant than what the candidates say they stand for. 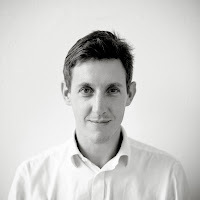 Candidates should be very keen to follow Shadow Election and try to engage with the service when they see their message is not coming through as they thought – or visa verse. It keeps the all important human "face" while also enabling issues to be rated and the data collected for analysis. It would hopefully give another user activity alongside the popular voting. We would love to know what our community thinks about this approach as the next step forward. And the more Fans we continue to get the more chances we have of raising funding – so please do help spread the word. I am really excited by our last minute involvement with the Ethiopian Presidential Election because I lived and worked in Ethiopia for over 3 years. While there I gathered many fond memories and friends, and would love to help support the democratic development. It is important to emphasize that our poll is neither scientific nor representative of the registered voters in Ethiopia – it is, however, a "social object" for people from all over the world to gather around and have a debate about how the real elections and candidates could and should be. I thank everyone who has so far engaged with Shadow Election Ethiopia, and I wish those living in Ethiopia peaceful and successful elections. Click here to find out more about the Shadow Election team, and special thanks to our Commander-in-Chief, Juha Mattila, for keeping the dream alive and pushing us on ever upwards. NB: The roots of Shadow Election are in Finland where the current Ethiopian Prime Minister, Hailemariam Desalegn, studied for his Masters degree in Sanitation Engineering.